Okay, so I know Summer is officially over, but I just can’t seem to relinquish my dependency on freshness of the season. Last weekend, I experienced a rare morning when I actually got watch my preferred channel on TV for a brief bit (instead of Noggin, Disney, or PBS – the channels my daughter prefers)! What did I turn to? The Food Network, of course! After 1 episode each of Giada and Ina, I had 2 meals checked off my weekly menu. 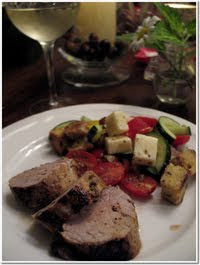 The Barefoot Contessa’s Herb Marinated Pork Tenderloin paired with Greek Panzanella were perfect finds to say farewell to Summer. My husband, Michael, loves bread, and all things carbohydrate. While I, too, am a carbaholic, it’s not often that I work bread into a meal. Call me unAmerican, but it’s just not something I think about! 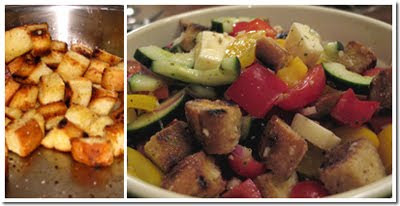 The toasted french bread pieces in the Greek Panzanella made Michael an instant fan! I substituted Mozzarella for the Feta cheese, and omitted the olives. If anyone has a trusted brand of creamy, non-pungent Feta, please let me know. We didn’t miss it, though, with the Mozzarella in it’s place. The oregano in the marinade for the pork ties in wonderfully with the vinaigrette for the panzanella, making the 2 a very suitable pair. Plan a little bit ahead b/c you need 3+ hours to marinate the pork, and about 30 minutes for the flavors in the panzanella to marry. It’s not a difficult dish by any means, but plan a little bit ahead for the marinade in particular. Penny introduced me to pork tenderloin when Michael and I were dating. It’s such a wonderful & versatile cut of meat, and so much more interesting than that “other white meat” alternative (aka, chicken)! If you still have a hankering for the freshness of Summer, give these recipes a whirl. Directions Combine the lemon zest, lemon juice, 1/2 cup olive oil, garlic, rosemary, thyme, mustard, and 2 teaspoons salt in a sturdy 1-gallon resealable plastic bag. Add the pork tenderloins and turn to coat with the marinade. Squeeze out the air and seal the bag. Marinate the pork in the refrigerator for at least 3 hours but preferably overnight. Preheat the oven to 400 degrees F. Remove the tenderloins from the marinade and discard the marinade but leave the herbs that cling to the meat. Sprinkle the tenderloins generously with salt and pepper. Heat 3 tablespoons olive oil in a large oven-proof saute pan over medium-high heat. Sear the pork tenderloins on all sides until golden brown. Place the saute pan in the oven and roast the tenderloins for 10 to 15 minutes or until the meat registers 137 degrees F at the thickest part. Transfer the tenderloins to a platter and cover tightly with aluminum foil. Allow to rest for 10 minutes. Carve in 1/2-inch-thick diagonal slices. The thickest part of the tenderloin will be quite pink (it’s just fine!) and the thinnest part will be well done. Season with salt and pepper and serve warm, or at room temperature with the juices that collect in the platter. Directions Heat 3 tablespoons olive oil in a large saute pan. Add the bread cubes and sprinkle with salt; cook over low to medium heat, tossing frequently, for 5 to 10 minutes, until nicely browned. Add more olive oil as needed. Place the cucumber, red pepper, yellow pepper, tomatoes and red onion in a large bowl. For the vinaigrette, whisk together the garlic, oregano, mustard, vinegar, 1 teaspoon salt and the pepper in a small bowl. While still whisking, add the olive oil and make an emulsion. Pour the vinaigrette over the vegetables. Add the feta, olives and bread cubes and mix together lightly. Set aside for 30 minutes for the flavors to blend. Serve at room temperature. Posted on September 27, 2009 at 7:43 pm.